Warner Bros.’ theme park in Abu Dhabi will feature Justice League-themed rides. Warner Bros. and park developer Miral shared new details about its 1.65 million-square-foot indoor theme park, called Warner Bros. World Abu Dhabi. It will offer over 20 rides across six themed lands, which are Metropolis, Gotham City, Cartoon Junction, Bedrock, Dynamite Gulch, and Warner Bros. Plaza. The Metropolis section will be a Manhattan-like skyscraper city, with Superman, Wonder Woman, Aquaman, and other Justice League members. Some of the rides include Justice League: Warworld Attacks, a 5-D ride-through attraction with special effects featuring Superman, Batman, Wonder Woman. Last week, Rockstar Games delayed Red Dead Redemption 2 for the second time, pushing the much-anticipated western to October 2018. Take-Two, the parent company of Rockstar Games, today held its first earnings call since that announcement. CEO Strauss Zelnick commented on the delay, reiterating what Rockstar said–that it needed more time to polish the game–adding some further words of his own on the news. Perhaps most notably, Zelnick said he is “confident” that the game won’t be delayed again. Finally, Zelnick discussed Rockstar’s ambition to never rest on its laurels but instead continually push forward with new and innovative ideas. Rockstar stands alone in this regard, Zelnick argued. In other news, Take-Two’s newest earnings report showed that GTA Online continues to make lots and lots of money from microtransactions. We also learned that GTA V has now shipped an astonishing 90 million copies. Who Are Deadpool’s New Teammates? The debut trailer for Ryan Reynolds’ Deadpool 2 has finally arrived and it’s every bit as fun and action-packed as we hoped it would be. We finally get to see Josh Brolin’s Cable in action and the trailer’s packed with great jokes – including a jab at Justice League’s handling of Henry Cavill’s mustache. Who do you think these mysterious new mercenaries are? Let’s discuss in the comments! In Rogue and Gambit #2 by writer Kelly Thompson and artist Pere Perez, readers were given their first look at the never-before-seen first meeting of Rogue and Gambit. We conducted an email interview with Thompson to dig deeper into this pivotal moment between one of comics’ most iconic on-again, off-again couples. 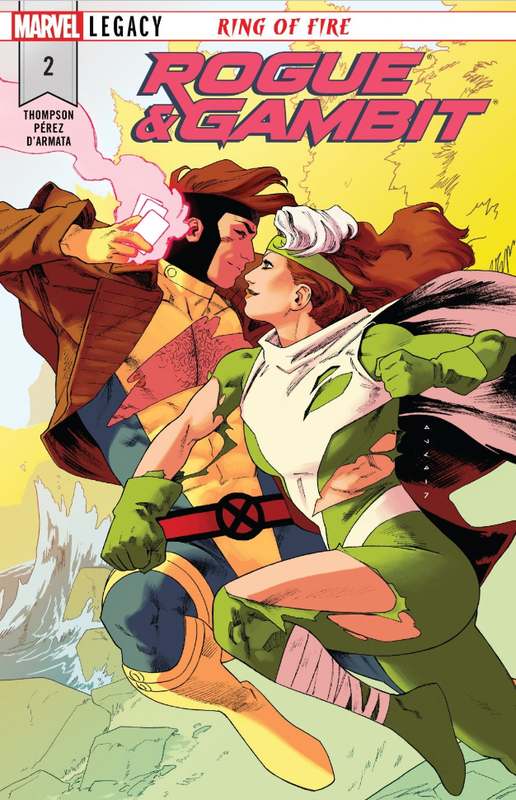 The story sees Rogue and Gambit going on a mission to investigate the mysterious Paraiso Island, home to a mysterious company putting up a front as a couples’ therapy retreat program. Because of their authentic (and troubled) romantic history, Rogue and Gambit were the best pair for the job. As they sneak around to learn the truth about the program at night, during the day they must actually participate in couples’ therapy, which is how we hear them recount their first meeting. But it turns out they have differing accounts on when and how they first met. Apple’s Amazing Stories reportedly has lost showrunner Bryan Fuller. The Hollywood Reporter cites creative difference as the cause for Fuller’s departure from one of Apple’s first scripted TV series. Fuller reportedly wanted to do a darker, Black Mirror-type show while Apple wants to go with a more family friendly tone instead. Fuller had been attached to the project since 2015, when the 10-episode anthology series had been in the works at NBC before Apple picked it up last year. Fuller would have served as showrunner and executive produce the series along with Steven Spielberg, Hart Hanson, Justin Falvey, and Darryl Frank. Hanson will now be taking on a larger role on the show, according to THR. Here’s everything you need to know about Cable: time-travelling mutant from the future, key X-Men player, and Deadpool 2 star! This month’s Humble Monthly Bundle gives you a full digital copy of Dark Souls III as well as one of the two major DLC packs, Ashes of Ariandel. The base game alone still sells for up to $59.99 on Steam, Amazon, and most other outlets. You can find console versions for cheaper than the PC version, but not for $12. In fact we think this is the cheapest the game has ever been – the base game briefly dropped to $15 last month. Dan Slott has been flying solo on Amazing Spider-Man for the better part of a decade now, and that doesn’t even count his many contributions during the series’ Brand New Day era. But even after all that time and with Slott’s Spider-Man saga so close to the end, I still find myself wishing we could get more. The drawback to this current “Threat Level Red” story arc is that Slott and co-writer Christos Gage are telling entertaining stories that could be that much better with a little more space to breathe. The good news is that issue #795 doesn’t suffer as much as #794 from being crammed into a done-in-one format. Mostly, that’s due to the fact that Slott and Gage aren’t resolving one of their own open plot points, but rather tackling a loose thread that dates all the way back to J. Michael Straczynski’s tenure on the series. 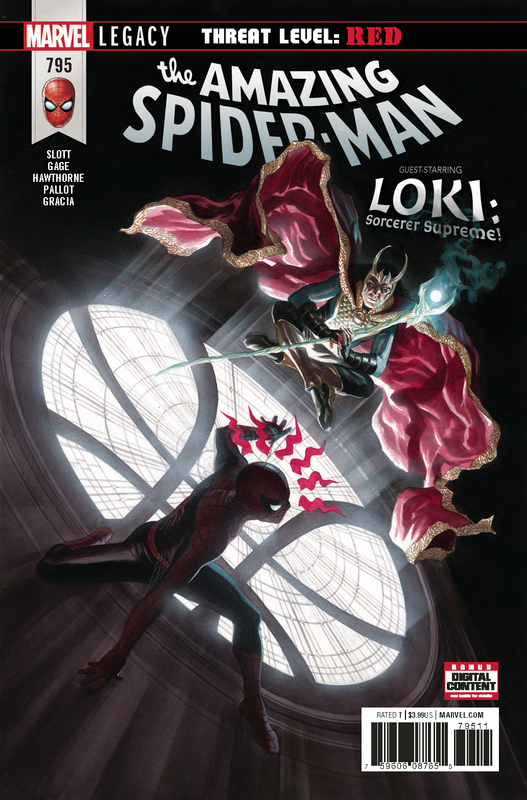 In the process, readers get an amusing team-up between Spidey and the current Sorcerer Supreme, Loki. The way the writers revive that loose thread and make it work in the context of Loki’s new status quo is extremely clever. We’re coming up on the first Valentine’s Day since the launch of Destiny 2. Much as it did with the previous game, Bungie will mark the occasion with a special Crimson Days event that introduces a variety of new rewards to get your hands on. Crimson Days begins on PS4, Xbox One, and PC on February 13. Like the Destiny 1 incarnation, it centers around a 2v2 Crucible gametype. You’ll be playing a round-based Clash mode where staying close to your teammate causes your abilities to recharge faster. By moving away from your partner, you’ll not only lose that buff, but the enemy will be notified about your whereabouts with a waypoint. You’ll always have a marker to guide you to your teammate, which will be particularly useful when playing with random players, as you can join solo and be matched up with someone. This is all played out on a new version of the Burning Shrine map. Called The Burnout, Bungie describes it as “set in a future timeline where the Vex have succeeded in altering our reality.” You can get a glimpse of it in the gallery below. Bungie says in a blog post that taking part in this playlist is the optimal way to get your hands on the event’s new rewards, also noting that it’s “tuned the experience to focus on rewarding single-character play.” The Crimson Engram contains “most” of the new rewards and will not hand out any duplicates until you’ve obtained all of the new gear. The playlist isn’t the only way to get items, however, as you’ll get both a Crimson Engram and an Illuminated Engram each time you level up while playing any Destiny 2 activity during the event. Crimson Engrams will only be obtainable through gameplay, meaning there shouldn’t be any complaints that players are being pressured into purchasing them with real-world money. That said, you can purchase a “selection” of items directly from Eververse using Bright Dust. There’s no cap on the number of Crimson Engrams you can earn, but you’ll need to be at the level cap (20 for non-DLC owners, 25 for those with Curse of Osiris) in order to get the level-up reward Engrams. The rewards inside, including shaders from the event, can be dismantled into Bright Dust. Complete the milestone Welcome to Crimson Days by finishing five Crimson Days matches and visiting Lord Shaxx in the Tower to earn the Fire of the Crimson Days Emblem and the Tirastrella Ghost Shell. Complete matches in the Crimson Days Crucible playlist for a chance to earn the Undeterred Exotic Sparrow. Complete either the Leviathan Raid or the Raid Lair: Eater of Worlds to claim the Dieselpunk Exotic Ornament for Wardcliff Coil from the final chest. Complete the Nightfall Strike during the Crimson Days event to earn the Flaunting Dance Emote. Crimson Days begins on February 13 and runs until the weekly reset the following Tuesday, February 20. The event comes not long after the first Iron Banner of Season 2, which recently wrapped up, as well as an update that introduced Raid armor perks and Masterwork armor. More significant updates are also on the way in the months ahead.